London’s Brick Lane is known for its never-ending parade Indian and Bangladeshi restaurants—all of which have the No. 1 chef, were at some point Restaurant of the Year, and offer “special deal 20% off and wine bottle just for you pretty lady.” Among these, Loco Mojito stands out due to its Mariachi music, cowboy hats on walls, and faux cowhide barstools. It tries. It tries very hard. Loco Mojito appears to be suffering from an identity crisis. The sign proclaims “Cuban Mexican.” The menu amends that to “Tex Mex,” and doesn’t have a single Cuban dish—not even a gringo-ized Cuban sandwich! Then there’s the “BLT enchiladas” issue. Seriously, Loco Motjito? Nacho Patrol is a fan of bacon, but it seems unlikely that the sheer awesomeness of bacon could offset the grossness of baked lettuce covered with cheese and hot sauce. There were four nacho options: vegetarian, pulled chicken, ground beef, and chorizo / olive. The waitress informed us that the portion size was “normal.” She seemed slightly confused when we asked what “normal” meant? (Answer: “uh, normal.”) We started with the pulled chicken nachos. 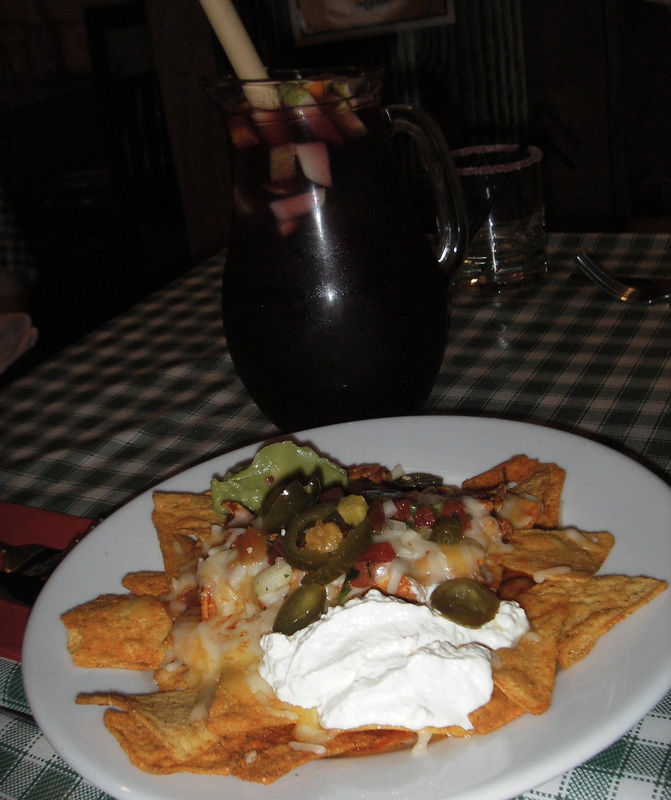 After making it through that plate (and a pitcher of sangria) we also tried the chorizo / olive nachos. Appearance: (5) The nachos looked fairly chaotic. The sour cream and guacamole were relegated to their respective corners, while the middle of the plate was piled with everything else. Distribution: (3) A single layer of chips was sandwiched between the chicken and the cheese, salsa, sour cream and guacamole. We used most of the chips for the top layer toppings. By the time we reached the chicken, there were hardly any chips left, and the few remaining ones were too soaked with salsa and cheese to be of any use. The nachos morphed into chicken-cheese casserole and we switched over to forks. There was also way too much sour cream and not nearly enough guacamole. Though, to be fair, we’re not sure there can ever be enough guacamole. Quality of toppings: (8) It may have turned into chicken-cheese casserole, but it was good casserole! The chorizo was excellent, as was the pulled chicken. Too often, chicken appears in nachos as large chunks that can’t be scooped up with chips. This chicken was well-seasoned and tender enough that we could pull off small pieces with the chips. Interestingly, the chips had subtle seasoning that gave them a kick. Price: (7) 4.25 GBP / $6.98. We’ll concede that the waitress was right; the portion size was “normal.” We thought these nachos were a good value considering the quality of the chicken. We see potential for great nachos, just by adding more chips. As for Loco Mojito’s larger identity issues, though, we’re not sure what the fix is.